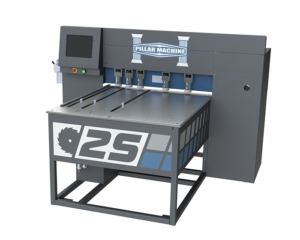 The 2S is a multi-axis, mulit-function CNC horizonal machine. It is designed to size edge glued panels safely and accurately. This raised panel door machine can also be Pillar-Linked to any order entry program and scan bar codes to virtually eliminate the need for the operator to do anything other than load the part to be cut. One of the greatest features of the 2S is the safety factor. The potential risk of getting any fingers in the way of the saw blade is nearly non-existent. The design of the machine itself along with the process of how an operator uses the machine keeps hands clear of the moving blade during proper use. This raised panel door machine has touch screen controls to enter the panel dimension and control the CNC fence positioning. Once a panel size is entered it takes about 30 seconds to size the panel to the correct dimension. All scrap is removed automatically allowing the operator to concentrate on producing product. The Pillar Machine PLT (Panel Lay-up Table) will speed up, improve color/grain match and increase yield when producing edge glued panels. The machine utilizes CNC positioned lasers to show the operator the required size. Providing this visual representation of the correct panel size will allow the operator to concentrate on creating the highest quality panel with the least amount of waste. The table is mounted at a 45 degree angle giving the operator an ergonomically friendly position to sort through panel staves and find the best match of color, grain and yield. The standard table will allow for panels up to 36" x 60", different table sizes are available upon request. With the popular Accu-Link option, once panel staves are combined, the operator tells the software that the panel is completed. That panel is then removed from the open order list. 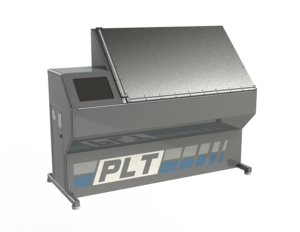 To help automate the rest of the downstream panel production, the PLT can be equipped with a bar code printer to give panel information to machines that will size, sand or profile the panel. The software is also capable of bi-directional communication, so that the office can be constantly updating the open order list with new orders and check to see which panels have gone on to panel glue up. This ability to monitor and adjust production flow will decrease lead times. If you're searching for a wooden door or cabinet door machine, look no further than the PLT.